2015 ARTBA Chairman Nick Ivanoff, above, speaks at a Capitol Hill news conference. Senate Environment & Public Works Committee Chairman Jim Inhofe (R-Okla.) and Ranking Member Sen. Barbara Boxer (D-Calif.) held a news conference April 15 to urge their colleagues to take action to fix the Highway Trust Fund (HTF). 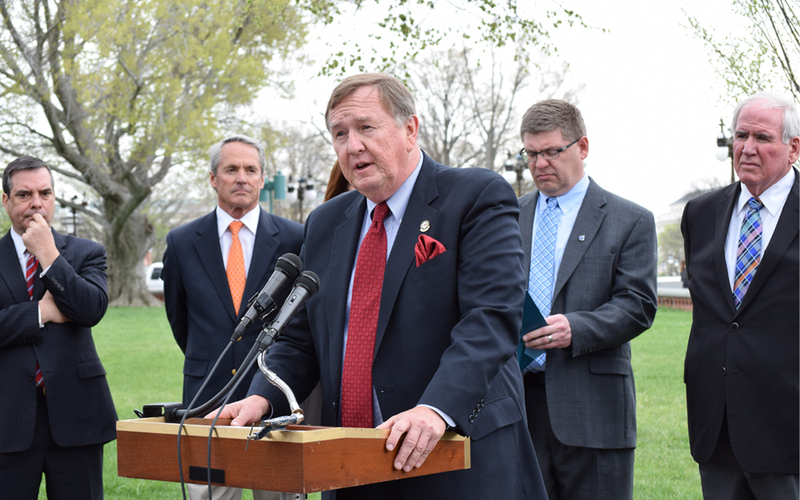 The senators were joined by transportation advocates including 2015 ARTBA Chairman Nick Ivanoff, ARTBA President Pete Ruane, AASHTO Director Bud Wright and several others on the lawn of the Capitol in the latest call to action ahead of the May 31 highway/transit funding expiration. Both agreed the HTF needs to be fixed, but Boxer said the trickiest part remains how to do so. ARTBA’s Ruane noted over 600 representatives from 45 states were in town, not for the cherry blossoms, but to tell Congress to “do their job” on the issue. Ruane also quoted President Abraham Lincoln on the anniversary of his death, saying ”you cannot escape the responsibility of tomorrow by evading it today.” A sentiment echoed by other advocates that Congress needs to stop borrowing now and passing the costs on for future generations.